K.A.J. Dykkertjeneste performs both diving and/or remotely operated vehicle (ROV) inspections inshore. The company is experienced in seabed-sampling, ROV operations regarding wave energy parks, bridge or quay inspections, and boat and propeller maintenance. K.A.J. Dykkertjeneste is approved and certified for in-water survey (IWS) inspections by the American Bureau of Shipping (ABS), DNV-GL, Exxon and Sellihca. The company performs underwater inspections and repairs on foundations for docks at Exxon Slagentangen, and condition surveys of construction works and foundations for large bridges for the Norwegian State Highways Authority. K.A.J. Dykkertjeneste offers ROV inspections of subsea cables and pipelines, as well as assistance with installation and interconnection cables. The company’s ROVs have global positioning systems (GPS) and multi-beam sonar capabilities. K.A.J. Dykkertjeneste supplies biodiversity inspection and mapping services for scientific applications. The company undertakes sampling to proof quality or contamination of the seabed, with mapping and video of the subsea location, in addition to sampling before and after the harbour area has been dredged. K.A.J. Dykkertjeneste is experienced in designing and manufacturing special equipment or tools to address challenging operations. The company aims to achieve the highest level of quality by being ahead of technological developments, and deliver the service and product requested by the client. K.A.J. Dykkertjeneste’s Mercedes Benz 4×4 diving station comes with a 150m-long umbilical and is easily deployable. 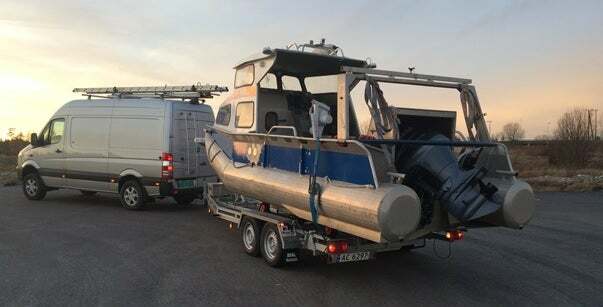 A 22ft Hårek aluminium trailer-mounted workboat is also available, featuring Garmin dynamic positioning equipment, a 150hp engine, a mobile decompression chamber, and ROV or diving equipment as required. The company supplies additional components such as crane trucks, mobile accommodation, and equipment for a wide range of applications. Established in 1986, K.A.J. Dykkertjeneste is located in Råde, south-east of Oslo, Norway. Offering a 24-hour service, all divers have a technical background and unique skills, such as diving civil-engineering, concrete construction, as well as geology expertise and geotechnical solutions. The wide range of experience and knowledge enables the company to offer a comprehensive service. K.A.J. Dykkertjeneste has primarily focussed on ship maintenance and repair services in recent years, however the company has a long history of successfully completing a wide variety of tasks, ranging from minor lifting to minesweeping.